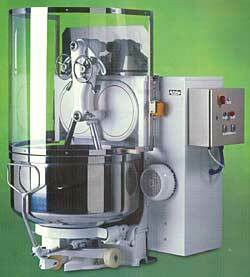 The ever popular Artofex Twin Arm Dough Mixer is still available and manufactured in the United Kingdom. Flour capacities of 63, 95, 127 and 190kg giving dough capacities of 80, 150, 200 and 300kg. The machines are available with a single speed motor plus timer or with a two speed motor and twin timers. All machines are fitted with up and over clear guards with interlock safety switches.